How many times in a year does it happen to you that you completely finish off a beauty product and repurchase over and over again (here, I am not talking about body lotions, body washes and shampoos/ conditioners, which I finish almost every second month)? Well, this doesn’t happen quite often with me at least and I am sure not with many of us makeup/ beauty hoarders. So, when I saw some of my empty jars and tubes, I was quite ecstatic and started saving them for an empties post. While my trash was growing real slow there were some products that I had already repurchased. 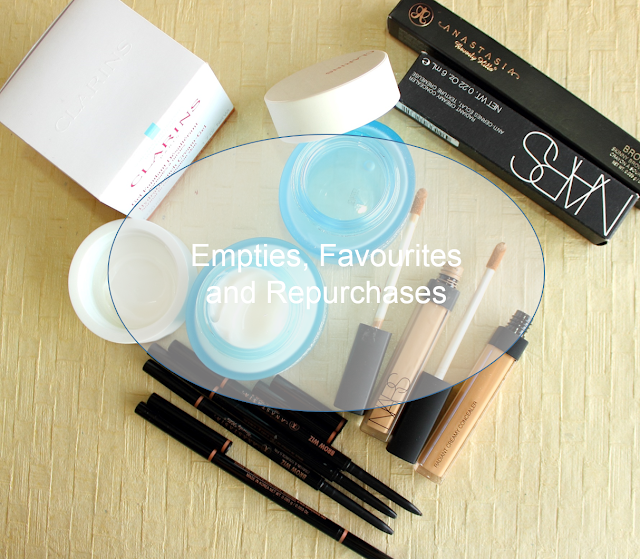 So, I thought why not do the ‘empties’ post a little differently and show you my repurchases with mini-reviews of these products. The first product that I really want to talk about is Clarins HydraQuench Cream Gel for Normal to Combination Skin. I have actually finished using 2 jars of this moisturizer and purchased it third time (I threw away the third jar after saving it for a really long time). I discovered this product in mid-2014 and since then I am hooked to it. Of course I used many other moisturizers, but, there was nothing which was as good as this for my dehydrated combination skin. This makes my skin so soft and supple and keeps it hydrated through the day. Never caused any irritation or break-outs and doesn’t make me greasy or oily. I like that this doesn’t have an SPF so, I can use it under my make-up without any fear of flash back/ white cast. However, this could be a con to many who like an all in one product at this price point (INR 3300.00). I find it comparable to Chanel’s Hydra Beauty Gel Cream, which is a tad bit more expensive (love Hydra Beauty range). If you don’t mind a heftily priced moisturizer, give it a go, highly recommend. While I am using it, I am also planning to try Kiehl’s Ultra Facial Lotion (I have tried the cream but found it heavy for my combination skin and passed it on to my mom who has terribly dry skin and she loved it) and Clinique Dramatically different moisturizer. I have hereditary dark circles (thanks Mom) and I am always on a hunt to find concealer to cancel out darkness around my eyes. I had been using MAC’s Prolong wear concealer for quite some and wanted to try something new. So, I picked up Nars Radiant Creamy Concealer in two shades, Ginger and Biscuit, because I was not sure of the right shade for me. I used both shades alternately and liked Ginger better. It covers like nobody’s business. It’s thick in consistency and drier than MAC Prolong wear, and that is the reason, according to me, it creases in one prominent line under my eye. If I use my UDPP underneath this concealer and set it with my Laura Mercier Secret Brightening powder, it’s sealed for the day. Not so long ago I got myself a Bobbi Brown corrector and love my Nars concealer on top of it. Before I run of Ginger I got myself a back-up and last week I finally ran out of it, after using for good 7-8 months. However, I haven’t opened the new tube yet (except for taking some photos), as I am trying to finish Biscuit shade and MAC Prolong wear (I have discovered a trick, which is for another post). While I am trying to finish them, UD Naked Skin Concealer, MUFE Ultra HD Concealers (recently launched or yet to be launched) and Clea de Peu concealer are in my wish list. Bold, thick, bushy, sculpted brows were quite a trend in 2015, thanks to several brow product launches, but, primarily to Anastasia Beverly Hills brow products. I also jumped into this trend early this year and got myself Browwizs’ and Pomades in couple of shades. When the first time I used Browwiz in Dark Brown (cooled toned ashy-brown but warmer than Ash Brown shade), I immediately fell in love as to how natural and defined my brows looked. The nib of this pencil is so fine that you can create hair like strokes with it. I like that this pencil is waxy and just by changing the pressure with which you are applying, you can control the intensity of color. Mid-2015, I colored my hair warm chocolaty-burgundy and thought of changing my brow game and got myself shade Chocolate, which is much warmer and red toned than Dark Brown. I have finished using two Dark Brown and one Chocolate Browwiz. I am currently using Dark Brown shade and another Browwiz in Chocolate is on its way. Love this product. This makes me feel quite content and feel satisfied that my hard earned money spent on make-up is put to good use and also help me categorize them in to what I really really love and would buy over and over again. How about you? What products did you guys used up and have repurchased over and over again? Hi Rashmi.. I am also sailing in the same boat, I am waiting for the day when I am able to finish an eye shadow or a blush! Do try the Dramatically Different Moisturizer! It's really good! I've gone on and off it a couple times now, but every time I revisit the product I remember how much I like it.